Our dedicated itinerant staff travel to the students’ assigned schools to provide direct, consultative, and collaborative special education services relating to the vision loss. These services are provided to students who qualify based on an educational need. Services may be provided to students birth to 21 in the school, home, or community settings as determined by the ARD Committee. Our instruction encompasses the nine areas of the Expanded Core Curriculum which was designed specifically for students with visual impairments. Braillists transcribe printed materials into specifically identified media modifications (braille, large print, tactile graphics, etc.) based on adaptation provided by a Certified Teacher of the Visually Impaired. Specialized technical equipment and software are used to create these materials. 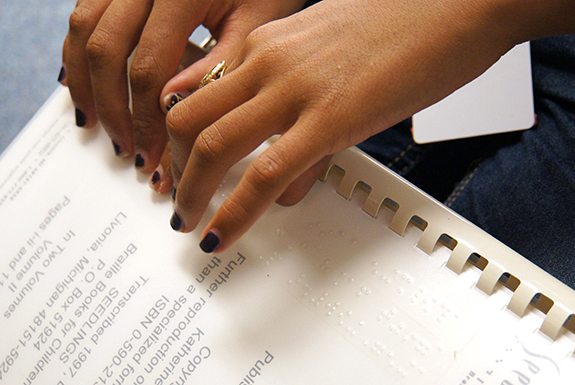 Texas state law requires that students with visual impairments receive materials at the same time as their sighted peers. To be in compliance with this law, braillists require a minimum of 5-7 days to produce the necessary materials. If a visual impairment is suspected, parents or educational staff can request that their campus contact the Visual Impairment Department. Our department must have a current eye report from an ophthalmologist/optometrist in order to begin the evaluation process. Based on ARD Committee decision, TVIs complete Functional Visual Evaluation and Learning Media Assessment and COMS complete O&M Evaluations. TVIs and COMS will collaboratively complete an Expanded Core Curriculum Evaluation. Services are determined by the VI Professional based on these evaluations and student need.